Never happened on the G&D, only in Varney ads. One pic John took shows a group hanging a diesel salesman from the trestle. The G & D was steam all the way! Any chance there is a link or something to this photo that the rest of us can check out? I suppose this is OT, but since it concerns the G&D I'll report here that I'm absolutely tickled that I finally managed to score a couple of the Roundhouse G&D "tribute" kits, an Overton combine and a drover's caboose. I'm looking forward to their arrival. Well, back to the steam era. . .
3. Did Allen have a No. 3? 4. 4-4-0 PFM V&T Reno? 5. Did Allen have a No. 5? 11. Did Allen have a No. 11? 16--24 Did Allen have any engines in these numbers? 26. 2-8-0 Looks to be UP prototype, PFM? 27. 2-8-0 Looks to be AT&SF prototype, PFM 1951 class? 28. 2-8-0 Looks to be AT&SF prototype, but doesn't quite look like the 27. 30-33 Did Allen have any engines in these numbers? 34. 4-10-0 Homebuilt job, Mantua drivers, Varney 2-8-0 boiler, etc. 37. 2-6-6-2 Great Northern prototype, but who made it? 40. 2-8-2 AT&SF prototype, but who made it? 41. Did Allen have a No. 41? 42. 2-8-2 Mantua engine; modified to look like a C&O K-3? 44. Did Allen have a No. 44? 46-47 Did Allen have engines in these numbers? 48. 4-6-0 Canadian Pacific prototype; who made it? 51-55 Did Allen have any engines in this series? 57-59 Did Allen have any engines in this series? 101. 4-6-4 A high-stepper on the G&D? What's intriguing to me are the gaps, most notably the number series between 30 and 33, and 51-55. 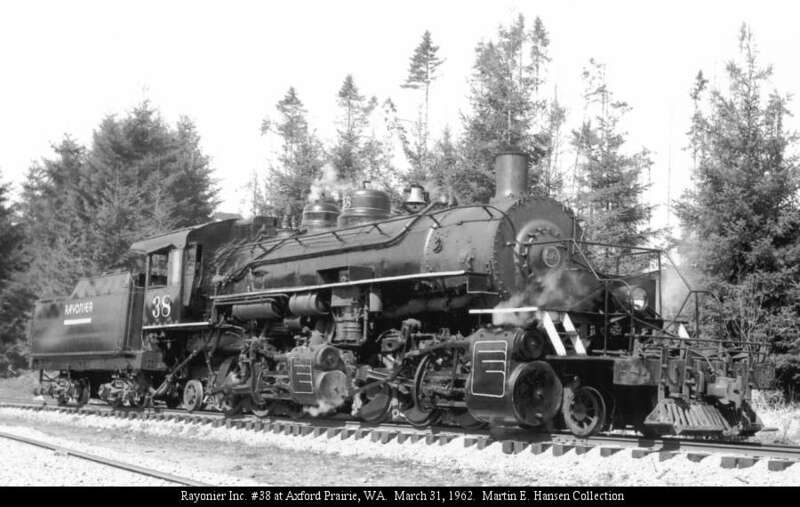 I picture 30-33 as being additional 4-10-0s, and that this was a custom order for the G&D from about 1920 to provide a heavy locomotive that could run on light rail. Nos. 51-55 would be other 4-6-2s, in two classes; 51 and 52 would be duplicates of No. 50, and in the prototype world, would not be considered the best locomotives due to poor steaming (firebox too small, Allen modified No. 50 to resemble such an older engine). Nos. 53-56 were based on a successful NYC 4-6-2 design that was actually a fast freight engine on that road, and would have been similar in performance to other freight 4-6-2s used on the Lehigh Valley and the Lackawanna, and would also be similar in proportions and performance to mountain passenger 4-6-2s built for the Virginian Railway and the Western Maryland. Other possible gap-fillers would be No. 3 (another 4-4-0), No. 11 (possibly another MDC 0-6-0), No. 5 (another 4-4-0 or another geared engine--these could also be locomotives that had been retired by the 1950s setting of the classic G&D), and Nos. 46 and 47 being additional 4-6-0s. This brings up a question I suggested before--What would a backdated G&D look like, set in the prewar era or even back to the 1920s? What other engines would be on the roster then that would have been "retired" before the 1950s era? 12 0-6-0 MDC Great Divide switcher MDC 0-6-0 repl. 15 0-8-0 Tenshodo USRA 0-8-0 brass kit MOW, switching "Renumbered from or to #5"
There is another engine I can't identify; it is the furthest to the right in this photo, next to a curving main line. It's the tank engine mentioned above with a diamond stack, and is notable in that it has a saddle tank (wraps around the boiler), but the top of the tank is flat (suggesting an older prototype), and the engine appears to have a peaked cab roof, also typical of older locomotives (i.e., No. 8, the Sargent Ennis). This is interesting--a tiny, European-looking narrow gauge tank engine, on a pedestal, apparently a preserved industrial locomotive; it's lined up above and behind No. 28's stack and a bulldozer in this photo. Wonder what the story behind that one is? This is interesting, several trolleys that do not look like the one Allen used for the Cooper electric line, and some orange traction motors (lower right corner). Visiting equipment? The "V&T"-looking 4-4-0 (Reno, straight stack) shows up in this photo, at the left in the photo at Angels Camp, just to the left of a long drovers' caboose, another visitor? One thing I noticed, John did not spend money on new lumber for his branch work. I've seen eBay listings for the ventilated boxcar, too. The combine and the drover's caboose arrived on Friday. I'm hoping some day I'll be able to get a coach to match with the combine. Ya think Bachmann could make a Spectrum version? This is really a logging Mallet, built by Baldwin, and late, too, like around 1930 or so. there is a wonderfull spread in the 1969 issue of model railroader mag, on the G&P wish i could have seen that layout in person. my issue is all but worn out from drooling over it. Greg. I never got to see John's layout either. I did get to see him one time and spent the day on a fan trip. That was about 6 months after I lost my wife first wife, and going on a fan trip with three small children. Needles to say I did not have any time to visit with John. John had a wonderful layout. One thing that John did was open the door for others. 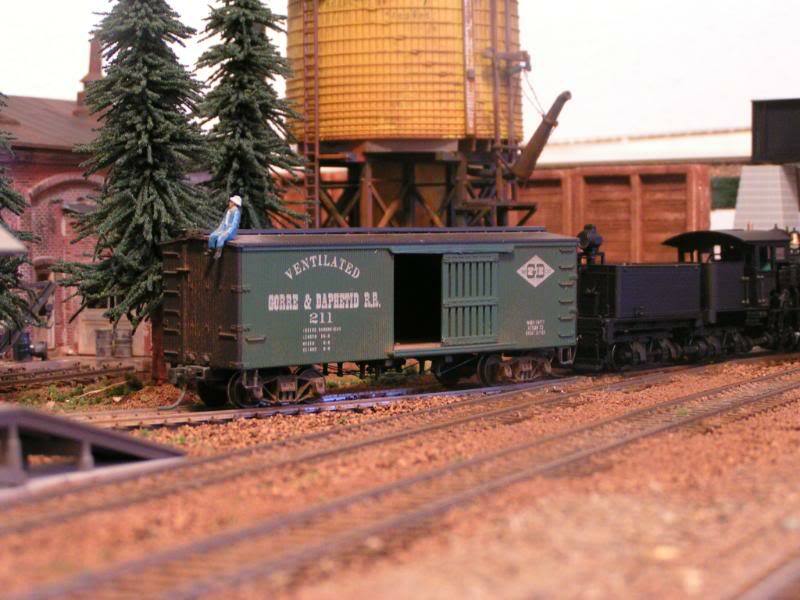 To day we have many layouts that are as good, if not better than John's.